Caves play an important role in the story of humanity. In addition to providing shelter for our earliest ancestors, caves were also often considered to be mystical and magical realms. For some cultures, caves are the gateways to the Underworld, while others believed that supernatural beings dwelled in these subterranean areas. Dunmore Cave of Ireland is one such place where stories both of real events and the supernatural can be found. Dunmore (meaning ‘great fort’ in Irish) Cave is a limestone cave located about 11 kilometers (6.8 miles) to the north of Kilkenny City, near Castlecomer. Within the cave, there is around 300 meters (99 feet) of known passages and caverns. Prior to the 18th century, caves, including Dunmore Cave, were regarded as places of dread and few, if any, dared to explore them. It was only from the 18th century onwards that people actually visited and explored the site, though the existence of the cave had already been known for centuries. After all, Dunmore Cave was at one point of time within the territory of the ancient Irish kingdom of Ossory, which was situated between the Viking strongholds of Dublin, Waterford and Limerick. The rivalry of the different Viking clans in Ireland provided one of the most chilling episodes in the history of Dunmore Cave. According to the Annals of the Four Masters, around A.D. 928, the Vikings of Dublin were marching to attack their rivals in Waterford. On their way to their enemy’s place, it is said they raided and pillaged the surrounding countryside. When they arrived at Dunmore Cave, they found a large number of women and children hiding in it. Allegedly hoping to capture them alive so that they could then be sold as slaves, the Vikings devised a plan to drive them out of the cave. They lit large fires at the mouth of the cave in order to force them out of their hiding. The fires grew too large and consumed the oxygen in the cave, resulting in the suffocation of the refugees. It is recorded that a thousand people died in this manner. In 1973, the bones of 44 people, mainly belonging to women, children and the elderly, were found in Dunmore Cave, thus giving some credence to the annals. Yet, whether there were as many as a thousand victims, or perhaps less, is another question. Artist’s depiction of a Vikings. Image source. Another sign of the Viking presence in Dunmore cave is the small hoard of silver and bronze items discovered in 1999. The treasure, which was discovered by a tour guide cleaning the site, made headlines, and the cave was closed for archaeological work. In addition to these precious objects, a silk garment was also found. More importantly was the fact that it was dyed with purple from the murex shell, thus showing that the Vikings of Ireland were trading as far afield as the Mediterranean. The fact that the hoard was left in the cave indicates that either its owner did not have the chance to return and claim his treasure, or that it was left as an offering for the supernatural beings believed to reside in it. Speaking of the supernatural, Dunmore Cave also has its share of fantastical stories. According to a 12th century tale, this cave was the site where Aithbel, an Irish warrior woman, fought and killed a cat-like monster called Luchtigen, the “Lord of the Mice”. Another legend relates to the Fairy Floor, an area where there are no fallen stones from the partially collapsed ceiling above. It is said that fairies sweep the stones away so that they may continue with their dancing. Dunmore Cave is also said to be the hiding place of Dame Alice Kyteler, a 14th century woman who was accused of witchcraft and sentenced to death, but managed to escape. After seeking refuge in Dunmore Cave, it is claimed that Kyteler managed to flee to England. Dunmore Cave is indeed an interesting place to visit. Apart from its rich history, the cave is also famed for its geological wonders, including some of the “finest calcite formations found in any Irish cave”. 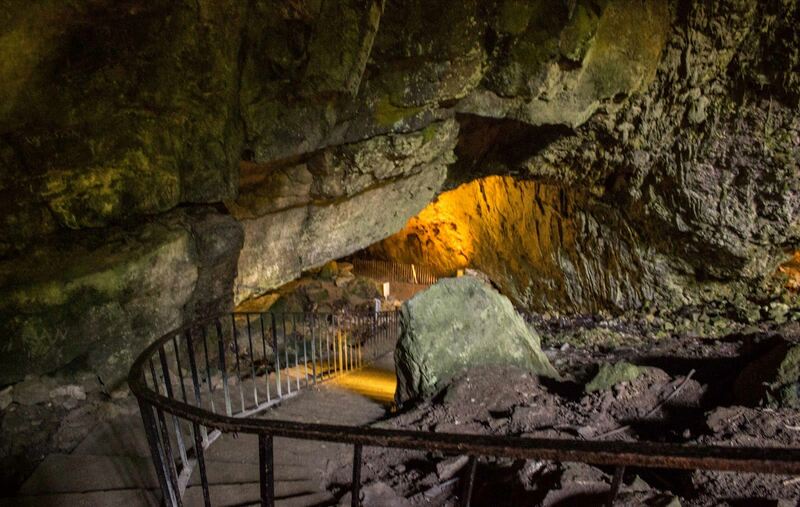 Although a ninth century Irish triad poem mentions Dunmore Cave as one of the ‘darkest places in Ireland’, it continues to attract many visitors who are keen to immerse in its rich and compelling history.